Advantages: Good developmental and operational summary of this important Luftwaffe type; large, well reproduced photos; German/English text; very attractive profiles with varied colours and markings. The Junkers Ju 88 was a remarkable aircraft. It served stoically on all Luftwaffe fronts in roles ranging from bomber, heavy day fighter, ground attack, night fighter, reconnaissance and flying bomb as part of a Mistel combination. The Ju 88 operated from the early stages of WWII until the last days of the conflict. Modellers have done quite well throughout the last decade or so with Ju 88 kits. Dragon has now produced most variants - including the stretched Ju 88G-10 and Mistel versions - in 1/48 scale; while AMtech, AMT and Italeri have various kits in 1/72 scale. 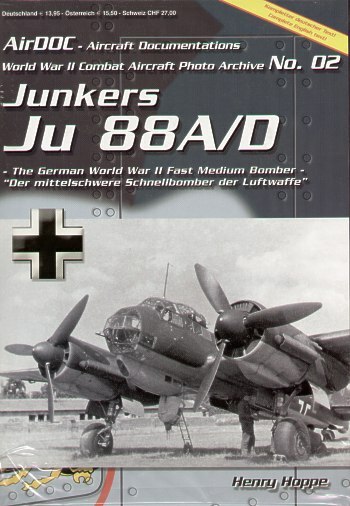 Hasegawa is the most recent manufacturer to enter the fray with their 1/72 scale Junkers Ju 88A-4. This appears to be the best 1/72 scale Ju 88 released to date. Despite this large quantity of plastic, references on this important Luftwaffe aircraft have been relatively scarce, especially on the bomber variants. Over the last five years or more, AirDOC has very effectively documented modern Luftwaffe types in addition to NATO allies over Germany. AirDOC now turns its attention to the wartime Luftwaffe. "Junkers Ju 88 A/D - The German WW II Fast Medium Bomber" by Henry Hoppe is the second in their WWII series. The book commences with a bilingual text summary of development, production, technical description of the A and D series and operational history. This opening section also includes a table listing the main Ju 88 A and D series sub-variants, their roles and characteristics. The focus of this title, however, is the wartime photos. These are well reproduced and pleasingly large with plenty of useful detail on display. I have not seen many of these photos published elsewhere either. All photos are accompanied by useful captions in both German and English. Even more interest is added to the book via 13 colour profiles. One of these illustrations includes four-views showing camouflage and markings on both sides, top and bottom. The schemes are varied, demonstrating that even these early bomber variants wore many more interesting colours than simple 70/71 Greens. "Junkers Ju 88 A/D - The German WW II Fast Medium Bomber" is an excellent modeller's reference for this famous Luftwaffe bomber, and is especially appropriate with the recent release of Hasegawa's 1/72 scale kit.